It is extremely odd to see an A pillar base so far forward on the fender of a BMW. And then it sinks in, BMW has gone and built a front wheel drive hatch. End of the world? No. Sad development? Not really. It’s simply the extension of BMW offerings into classes already occupied by their competitors, and acknowledgment of the times – and the need to build cars suited to changes in society and the changing tastes of its citizens. BMW has a great deal of experience building excellent front wheel drive cars. They’re known as Minis, and they handle and go quite well. When BMW migrated to their latest platform matrix they made allowance for a flexible firewall location in the smaller of the two architectures. This allows for rear wheel drive, front wheel drive, and all wheel drive models to be built from a similar engineering/production perspective. BMW decided that they needed to compete for the urban buyer of premium products that heretofore have been served by their competitors in the B and A class ranges of automobiles. These models must be physically compact on the outside to succeed in their environments, yet offer maximum interior space. The drivetrain solution, of course, is front wheel drive. BMW will tease its B-class offering with the debut of the Concept Active Tourer at the 2012 Paris Motor Show this September. 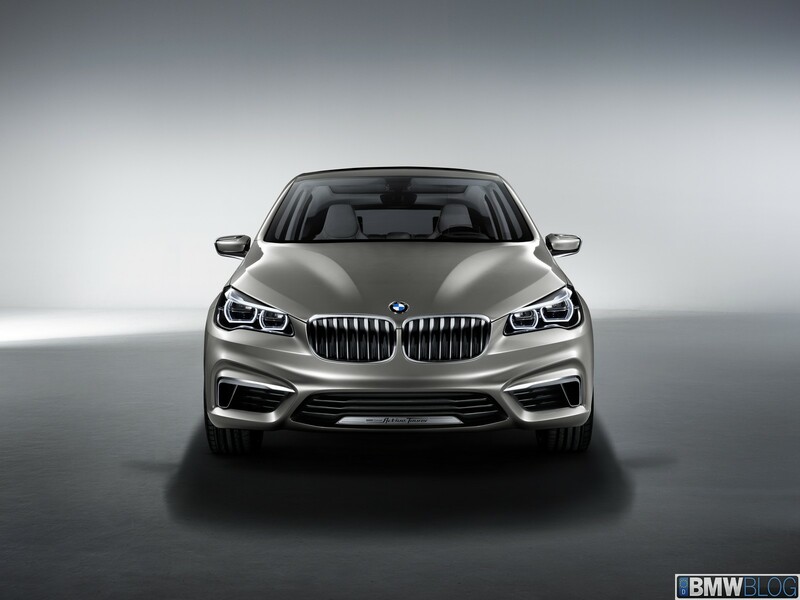 BMW is entering the compact luxury premium segment because there is growth potential and it will help BMW achieve its production goals. It will also reach a segment, and customer set, that BMW doesn’t currently serve. The Concept Active Tourer is shown as an active hybrid, utilizing both a three cylinder gasoline engine and an electric motor (the motor that will be used in the i-models). This is a similar drivetrain setup to that in the i8, and BMW refers to this as eDrive and it marks its entry into a core BMW product. The total package will deliver 190 HP and is, of course, a plug-in hybrid. This means that in low speed urban operation the car will run on the electric motor as much as possible. Given an urban use during the week and weekend getaways, the car offers extremely frugal operation on city streets and frugal, yet suitably quick, operation on highway. The average fuel consumption figures are reported to be less than 2.5 liters per 100 kilometers with carbon dioxide emissions of 60 g/km. Given a 200 km/h top speed and an under 8 second timing from 0 – 100 km/h and you can see that there is BMW performance coupled to EfficientDynamics. The compact exterior dimensions belie the excellent interior space. One key to maximizing interior space in small front wheel drive cars was uncovered a number of years back. Rather than make small cars reduced scale versions of their larger models, manufacturers figured out that if they increase the height – they actually can make seating more comfortable. And BMW takes advantage of that with the new Concept active Tourer. BMW has done good work making the proportions of the small B-class car look correct. The car has all the BMW styling hallmarks, twin-kidney grilles, Hofmeister kink, and L shaped tailamps. The concept utilizes an interesting paint scheme that further highlights the play of shadow and light by backing the high gloss finish of some surfaces with a matt finish on undersurfaces. The front fascia looks better in photos than that of the F20 1er, and they’ve handled the additional front overhang necessitated by the drivetrain by thrusting the kidney grilles further forward. It looks pretty aggressive. The car has a nice rake front to rear that further enhances its sense of motion. Yes, it’s FWD, but it should look as good as possible and BMW has done well with what could have been a very clunky – tall and narrow – format of a B class hatch (and look at some of the volume manufacturers’ styling in this segment and you can see how well BMW did). 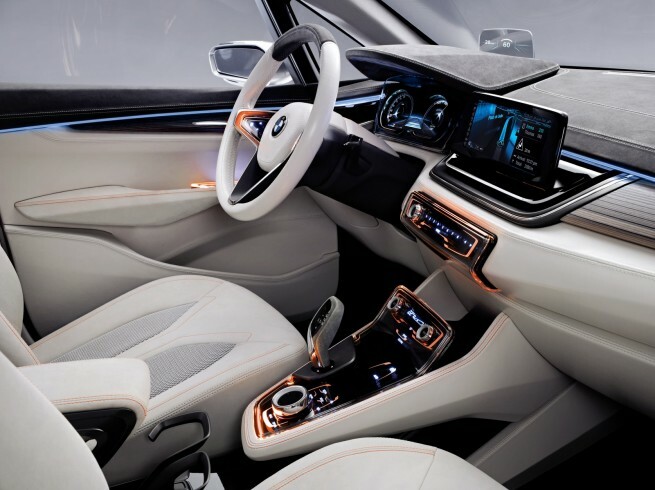 A specially crafted interior will hint at the production version to come, but connectivity is a key. The IP is composed of a multi-function display, rather than the traditional four round gauges. 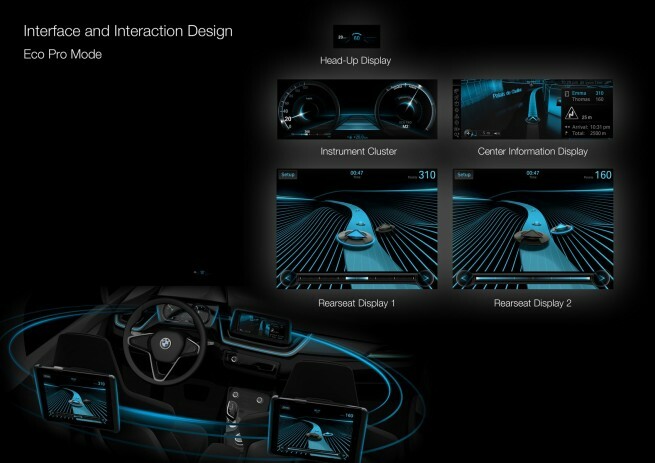 That will allow reconfiguration based on the needs of the driver or the driving mode selected. There is a panoramic sun-roof on the concept as well as three way split rear seatbacks and specialized cargo carrying features. Also mentioned in the press release is an eco-game that can be played by a rear seat passenger that interacts with the vehicle. 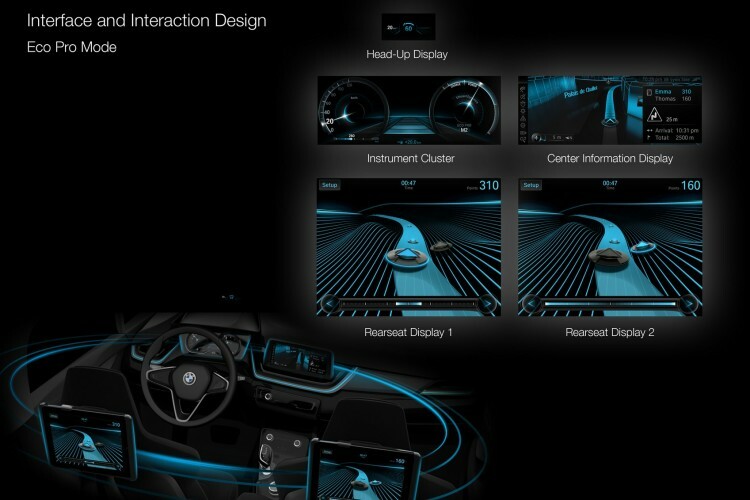 In BMW’s words, “Rear passengers in the BMW Concept Active Tourer can experience fascinating technology hands-on with the new iPad app “Seismic Surf”. “Seismic Surf” creates a game world in real time. It is an exciting ecological racing game which draws on the acceleration figures, engine speed and other data supplied continuously by the BMW Concept Active Tourer. Each real-life driving situation is interpreted and used to generate an infinite variety of new challenges in the computer game. The aim of the game is to collect as many points as possible along a virtual route and record the most efficient driving style. The driver can directly influence the level of difficulty. Anticipatory driving simplifies the game, while a sporty driving style creates a winding and more difficult virtual route in the game. Only perfect interaction between a fuel-efficient driver and a skilful player at the rear can maximize the point score and achieve a podium position in the BMW games universe.” So is this ‘Eco-Sunday school’ for junior while he coaches pop to save the planet? If so, no thank you. At the end of the day, BMW had to enter this segment to reach its goals. Knowing that with an A & B class offering they can extend the brand into the hands of emerging market customers and customers of city-sized transportation, BMW believes that now is the time to break with tradition and embrace front wheel drive.